April 2014 Weather in Phuket : Mostly Hot. Some Showers. April is doing exactly as April should here in Phuket. After the weather "broke" at the end of March, we've had a few more showers, but mostly very hot weather with people even dying from heatstroke last week. That is extreme, but it does need to be stressed - most of the time Phuket is HOT. You need to make sure that you stay hydrated, don't get *too* much sun. It's OK for me, I am used to it, but if you visit from chilly Europe, you can easily get dehydrated. And I hate to say it, but beer is not the cure! This is the HOT season right now. There is very little wind, the days are hot and the nights are not really cool either! The heat can build up until a thunderstorm clears the air, every day or 3 there will be localised thunder, nothing to really spoil a holiday and (believe it or not) actually quite welcome after all the heat. The last update on the Phuket weather blog was April 7th, 2 weeks ago. So I will now add some photos and Tweets from the last 2 weeks. It's April 21st today and I start a little holiday tomorrow. a couple of weeks not in Phuket! We'll be up and down the east coast of Thailand from Nakorn Si Thammarat to Chumphon to Hua Hin, maybe to Kanchanaburi, west of Bangkok, maybe hop over to the west coast to Ranong or maybe go to Koh Samui on the east coast. No fixed plan, but I am happy to have a break after a busy high season. For regular updates, photos, chat .. please do follow me on Facebook, Twitter and Instagram! Thanks! Moving on from the past... Here's a morning photo from April 9th. This is taken at the Bang Wad reservoir in Kathu, located in the hills behind Phuket Country Club golf course. Over the last month I have been here for a morning walk (6.5km around the reservoir) as many mornings as possible. It had rained a bit on the 8th, but only the usual brief downpour. Cleared the air nicely. April 10th .. hot and a bit hazy. (above) Scorpion in my garden, April 12th :) No, I did not kill it, just threw it into next door's garden. 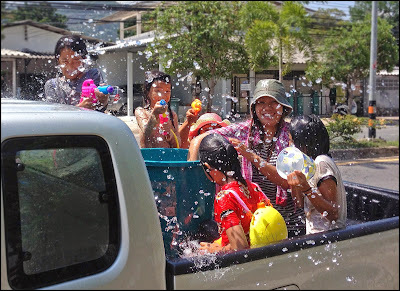 April 13th - SONGKRAN! I had prepared on the 12th and purchased a box of 24 bottles of Chang. No crazy party this year, only a bunch of drinks and a BBQ at the Easy Day Thailand office in Kathu, while throwing water at people passing by. April 14th, and back to work ... 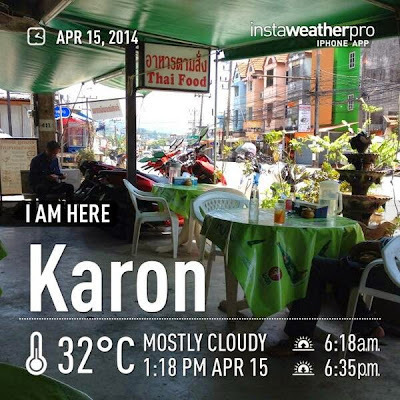 Sunny at Karon beach, though a friend in the Phuket Town area Tweeted that it was raining hard. Again, just a brief shower, and sometimes it can rain in one part of Phuket and not another. Little thunderstorms can cover just a small area. It was very hot after Songkran. Photo below taken at a small roadside restaurant called Nong Built, opposite Karon post office. Good cheap local food here! It felt hotter than 32 degrees! 16th April .. more heat. I Tweeted "Phuket weather this morning : Bl**dy hot and feels very humid too. I will hide in the aircon office at Sunrise Divers all day." 17th April "Woken up to a grey, drizzly morning", but the rain stopped, so I was off for my morning exercise at the reservoir. 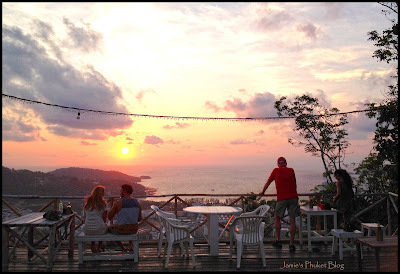 After work on the 17th I stopped at a bar in the hills over Patong for a sunset beer. I had meant to stop here for a long time, finally did, and will stop again - it's blogged on Jamie's Phuket : Wassa Homemade Bar. 18th April started wet. I Tweeted "It's a bit of a wet morning ... Grey skies , rumbles of thunder and rain" and the local new posted photos of flooded roads on Facebook. Don't panic unless I tell you to panic, OK? Flooded road photos sell newspapers. In Phuket you sometimes get very brief floods lasting about an hour when there is heavy rain. In low season, occasionally several hours. On April 18th morning I drove 20km to work from Kathu (near Phuket Town) via Patong to Karon beach. No flooded roads. The art of news is to find one flooded road and sell it as PHUKET FLOODS! Yes, I am a cynic. In the afternoon, some customers came into the dive shop and said the day had been great. The morning rain had them worried, but it cleared up and the day was pretty sunny. This is normal. And in the evening, well .. wow .. very nice sunset at The Beach Bar. One of our favourite places, on the beach at Cape Panwa. And the last 2 days have been hot and mostly sunny too. I am still in Phuket tomorrow, but will be away for a couple of weeks after that. I will also be watching the webcams on this blog (at Patong Beach / Karon Beach) to check on Phuket weather while we take a family holiday up and down the east coast of Thailand. See you soon!